When Twitter Inc. announced it was setting up shop here in Canada back in April, that was a doozy of a news item. But equally big was the statement it released simultaneously – that it had hired Kirstine Stewart of the Canadian Broadcasting Corp.(CBC), to become its managing director. With Stewart taking the helm at Twitter Canada this summer, there has been a lot of speculation about what that means for the social media giant. She took the opportunity at Digital Day 3D, a conference for digital marketers, to explain her hopes and goals for Twitter’s Canadian iteration. One of her first surprises? The furor she created when she left her previous position as executive vice-president of English services at CBC. “I was surprised to see the conversation would soon follow me. It wasn’t about me personally, but because it said something about the state of traditional media,” she said in a keynote address. Stewart made the comparison between the CBC, a national journalism institution, and Twitter, which she described “essentially as an app with 140 characters.” However, she was quick to tell people she doesn’t see Twitter as a disruptor to traditional forms of media like broadcasting. Instead, it complements and amplifies what traditional media already does, since it makes it easier to reach out to people, she said. But more importantly, it gives marketers something they never had before – the chance to know what people are talking about, without having to guess. When she was working at the CBC, her main job was planning programming. Typically, she had to guess what people were interested in watching, and what time slots would work best for particular shows. Now, just by following different hashtags, as well as tracking metrics, it’s easier for marketers to find out what people are interested in. 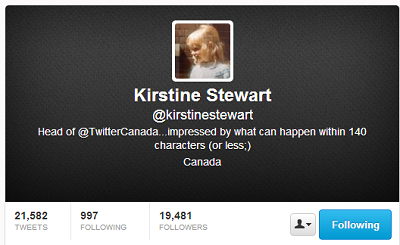 And of course, that works both ways – marketers use Twitter regularly to get their messages out, Stewart said. She gave the example of the hashtag #hungry, something regular Twitter users might use to tell their followers about their status. But it can also be a buzzword for marketers. If a marketer works with food, for example, he or she could take advantage of the #hungry hashtag, checking to see when it’s most active and when it’s a good time to jump into the conversation and use it as well. Some brands have been very creative with conversing with users, Stewart said. For example, Justin Timberlake’s team has used it to not only interact with fans, but to also promote the pop artist’s new song and album, all within on tweet. Stewart showed an example of a tweet that had an album pre-order link embedded right in the text of the tweet, while also containing a video link as well. Still, the biggest challenge in being head of Twitter Canada is making people aware of the social platform’s possibilities, Stewart said. Her hope is to make the social network more accessible and useable – and ultimately, to leverage it to reach as many people as possible.